Props. Listen, I’ve practiced yoga styles that scoff and straight up don’t ALLOW props. WHAT? Not my jam, because without some help I can’t quite get my body in a comfy position for breathing and movement. You don’t need a lot to get started, and most studios and gyms will have the basics for you to borrow during your practice. A wedge if I can grab it. I don’t use one often but they are handy for some postures! 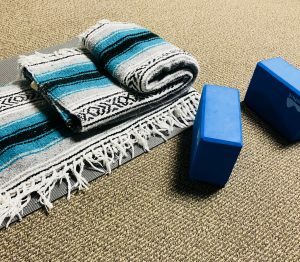 Blankets are great for helping to give a little extra support, whether when doing some breathing at the start and end of practice, or when sitting for a little boost (I fold them so that I can sit slightly elevated and take the pressure off of my low back and piano-wire hammies), or under your heels if you can’t quite reach the floor in your downward-facing dog (check out the guest blog post at Your Pace Yoga for some DFD options) or need some extra support dropping into chair. 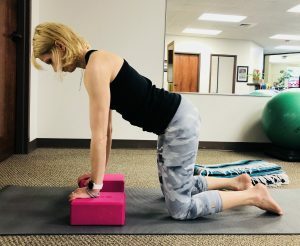 Blocks are my go-to for when I can’t reach the floor (ahem, forward fold), to take the stress off my wrists in table, and for support under my knees during cobbler’s pose. 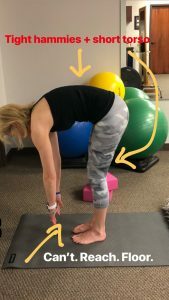 And a strap can be looped around your feet for support during head-to-knee and other seated forward fold postures if you have difficulty reaching your foot with your hands (even my long arms are not enough to overcome my runner hamstrings). Building blocks: Bring the floor to you! 2. Focus on your own practice. It can be hard when you’re starting something new, and you may find yourself looking around at other people to get an idea of what in the world a chataranga even is (kind of difficult and if you can’t do it, don’t sweat it- another opportunity for modifications) and yet still, how in the heck other people are on the next move while you are still in child’s pose? It’s OK to watch other people a little bit, especially if you are a visual learner. But bear in mind that everyone approaches the mat with their own issues and abilities, so while working to figure out the pose, don’t compare yourself to those who seem to move more easily than you. Everything is easier when you know how to do it, and you will gradually find that this is true in your yoga practice if you give yourself a break. It’s not a competition! Well, unless you are in a yoga competition, which is a real thing. Anyway, it’s not about where you end up- it’s about being mindful of the moment you are in. Meet yourself where you are, listen to your body, and do what you comfortably can. Tight Achilles? Try a blanket under your heels. 3. Be a control freak (a little): Move in the range of motion you have, and control the movement you make. The ‘goal’ of yoga isn’t how far you can stretch or how closely your pose looks like the instructor’s. It’s likely that some postures may be easier for you than others (Savasana is my signature move), while others may seem difficult or just don’t feel good for your body (I may or may not have a nemesis pose myself). If you need to use force or momentum to attain or maintain a posture, you may put unnecessary stress on your muscles, joints and soft tissue. 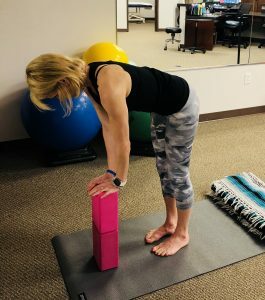 Instead, try a modification- instructors will often offer different levels of difficulty, particularly in a beginner’s class- this is a great opportunity to try a different twist on a pose you are struggling with. Over time, you may find that you are able to do some of your early ‘nemesis’ postures more easily (with or without props), and with fewer modifications. I’ve found that the more I have become comfortable with props and modifications, I get more out of my practice than when I was pushing through. 4. Keep your hands to yourself: Actually, this is for your instructor. Unless you are working with a physical therapist who has evaluated your body, you may prefer to request verbal or demonstration cues instead of manual assistance. It’s okay to do this, and good instructors will be happy to work within your boundaries. 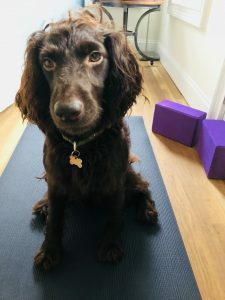 So now you are ready to give yoga a try! Find a beginner’s class and bring a friend- seek out the instructor before class if you have specific concerns or questions. 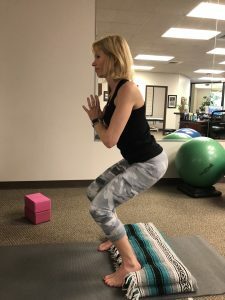 If you have an injury or want a more one-on-one practice, work with your physical therapist and coordinate to find a yoga instructor/ professional yoga therapist who can meet your needs. If you are in the Triangle, give us a call and schedule a PhysioYoga session @ (919)-571-9912! 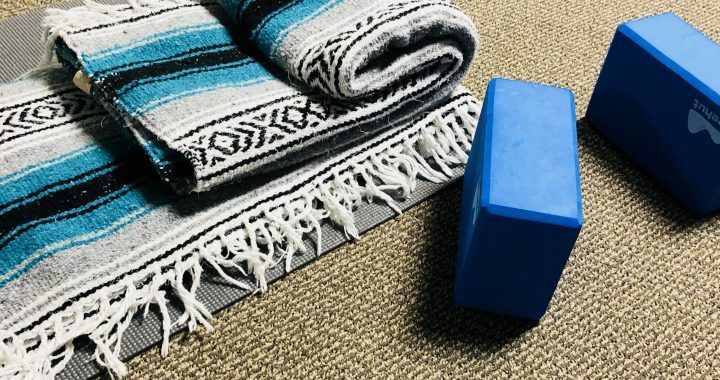 Resources: If you have questions about some of the basics of blanket folding and beginner postures, Dr. Ginger Garner has some great free access for getting started. Shelly Prosko at Physioyogo and Dustienne Miller from Your Pace Yoga are also wonderful resources to enhance your yoga practice.